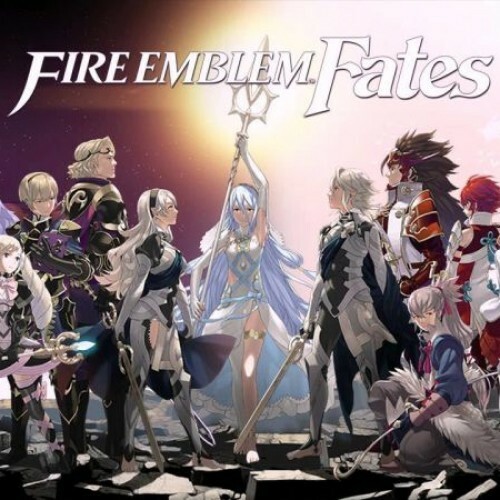 I'm Matt, a voice actor, editor, and huge fire emblem fan. 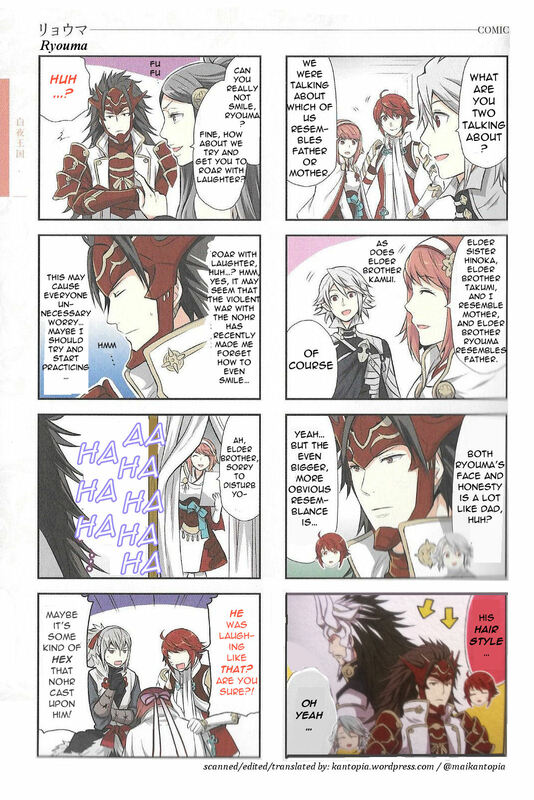 I am in my first year of college, and am excited to announce my first major project: A small dub of some of the comics for Fire Emblem Fates drawn by 4Koma! This will be a fairly small project, with only eight four-panel comics to be dubbed. It shouldn't be too many lines, so this is not a large commitment. 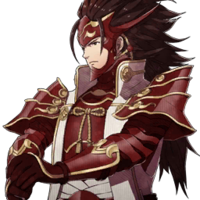 Ryoma is the eldest son and eldest child of four in the Hoshidan royal family. He is currently the nations general. Ryoma has a strong and deep voice, to match his leadership. He is sharp and to the point. I am Ryoma, High Prince of Hoshido, and he who inherited Raijinto. I will give my all, however dire the times would fit. You're always so diligent. Remember to rely on your allies for strength. And I say, think of me as a brother. This realm has a beauty so different from my own Hoshido. I would like to show it to all my siblings someday. 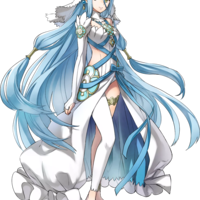 Azura is a gifted songstress and dancer who can perform the songs to help her comrades. She makes great sacrifices for others, and always has their well being in mind. Raised in two kingdoms now at war, she must choose a side. 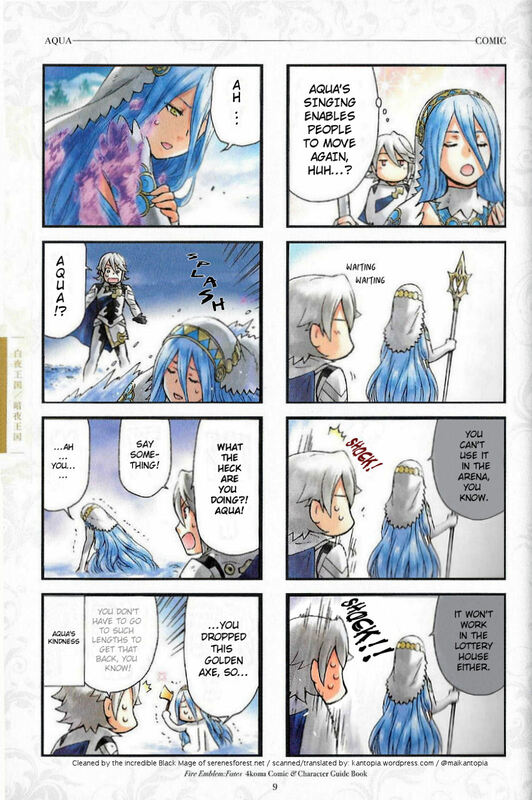 Azura has a soft, tender voice. She is kind, yet determined. My name is Azura. I offer you my song. As for where I'm from? Two kingdoms, in a way... Both Nohr and Hoshido. You'll often find me singing. I hope you like songs. They convey truth in ways that the written word cannot. There's no knowing for how long you and I will be here. So, friend, let's be sure to take care of each other. Leo is the youngest son and second youngest of five in the Nohrian royal family. Much like Camilla, Leo was unfortunately used as a tool by his mother in order to gain favour with Garon. Despite harbouring no love for his mother, Leo bonded exceedingly well with his three half-siblings. 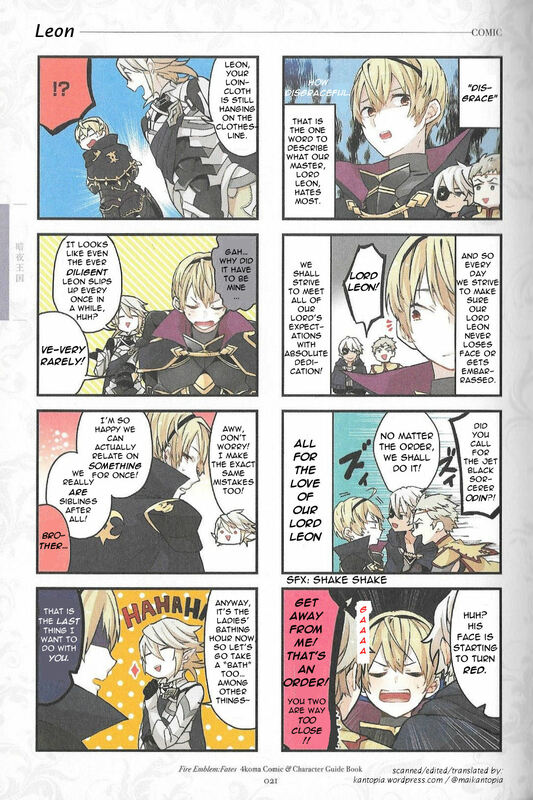 Leo has a medium, and slightly arrogant/cocky tone. He is very intelligent, and prideful. I am Leo, a prince of Nohr. I hold the divine tome Brynhildr, which grants me mastery over gravity. With less than a gesture, I have blasted many a fool to ashes. I'll expect clear orders in battle! You'd never guess what vegetable really catches my fancy... Tomatoes. Camilla is the eldest daughter and the second eldest child of five in the Nohrian royal family. 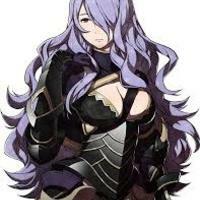 Much like Leo, Camilla was unfortunately used as a tool by her mother in order to gain favor with Garon. In a bid to fill the void left in the wake of the lack of maternal love in her life, she thereafter became obsessively attached to the Corrin, acting the part of the overprotective maternal figure to them. I'm Camilla, eldest princess from the Kingdom of Nohr. Need my protection, sweetie? Consider me yours. How sweet of you to look in on me. If ever you get tired after battle, come rest your weary head in my lap. Let's watch out for each other. You know what they say: I'll wash your back if you'll wash mine! 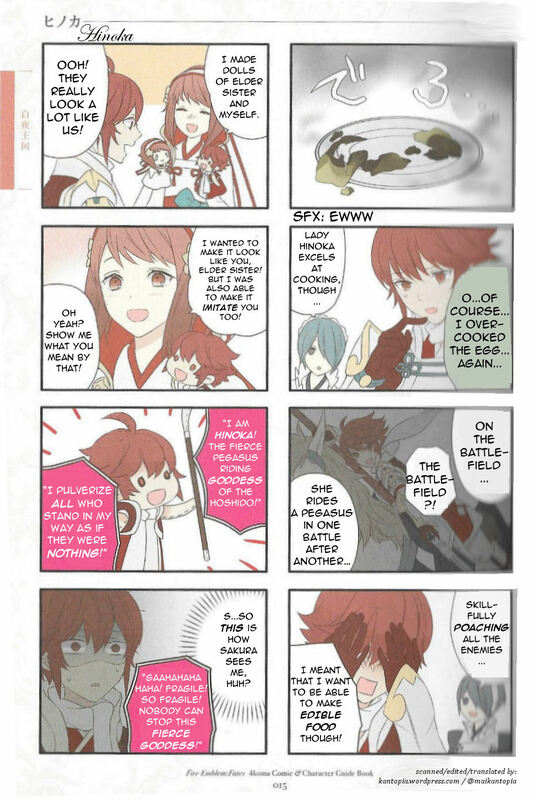 Hinoka is the eldest daughter and the second child of four in the Hoshidan royal family. 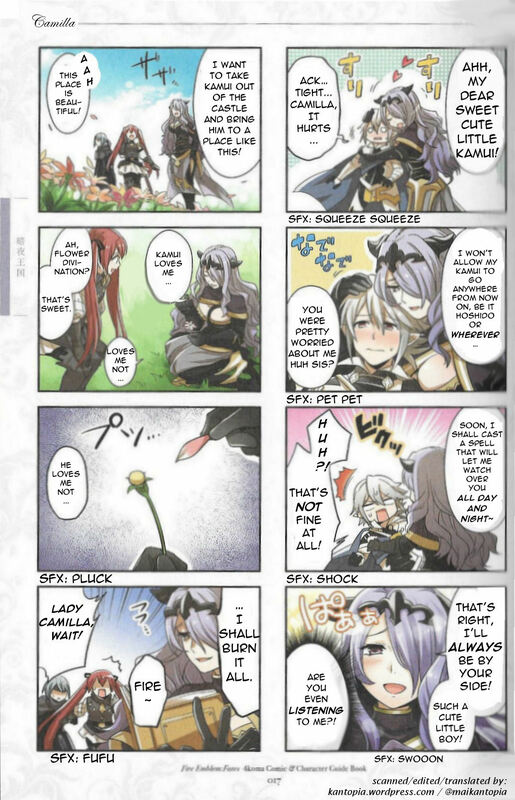 She originally had Corrin, whom she was very much attached to. However, Hinoka lost Corrin when they were kidnapped as a young child and raised in Nohr. Furious at her inability to prevent the kidnapping, Hinoka thereafter began training as a Sky Knightaround the age of seven. 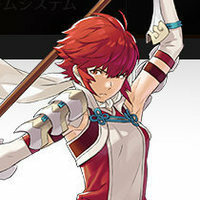 Hinoka has a strong and lower voice for a female, and is a fighter. Hot-blooded and emotional, but full of hope and goodwill.. I'm Princess Hinoka of Hoshido. I have a reputation as a warrior princess. So, happy to hit the battlefield for you! You can depend on me completely. There's something about you. For some reason, I feel like you're family! Whew! Enough training for today. Need to stay in top shape to keep everyone I hold dear totally safe. 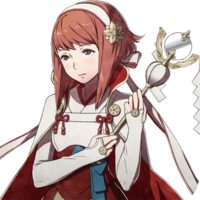 Sakura is the youngest daughter and the youngest child of four in the Hoshidan royal family. According to Ryoma, shortly after her birth, her parents named her after a cherry blossom tree that bloomed beautifully every spring. Originally having another sibling in Corrin, Sakura lost them when they were kidnapped as a young child and raised in Nohr. Rumors had spread throughout the castle that Sakura was supposedly the original target, but Ryoma had denied these notions to her. Still, this event had an effect on her personality, making her meek and timid. Sakura has a very soft and timid voice, but is doing her best to help others whenever they are in need. She become a healer for this very reason. She is very pure and genuine. I'm a princess from the Kingdom of Hoshido. But, please, call me Sakura. I'm delighted to help you! Are you checking on the others? So was I. It's important to make sure everyone's doing all right. I'm still finding my voice...But I like speaking with you! 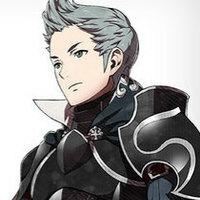 Silas is a fledgling Knight of the Kingdom of Nohr and child of a Nohrian noble family, having knownCorrin since childhood and considers them his best friend. 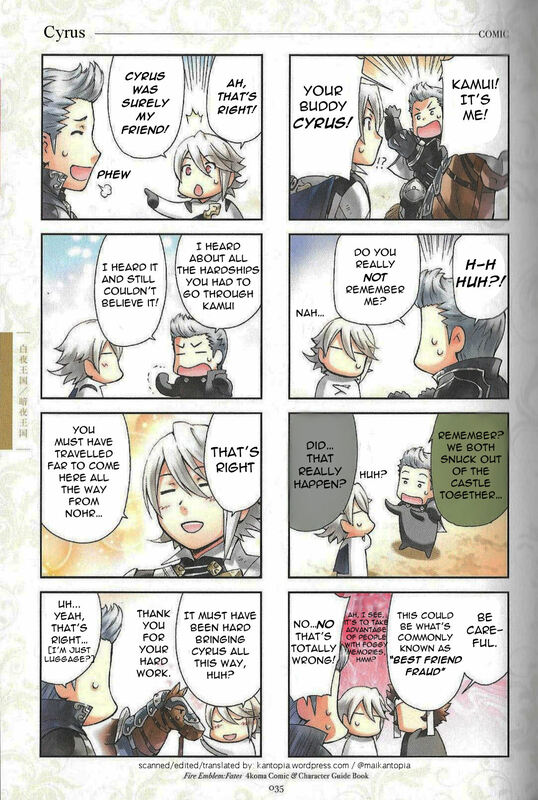 One day, Silas decided to bring Corrin out of the Northern Fortress on a picnic. 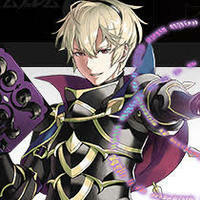 However, he was caught by the guards and was nearly executed if not for Corrin's strong opposition. Instead, he was banished from the fortress, but he never forgot his friend. 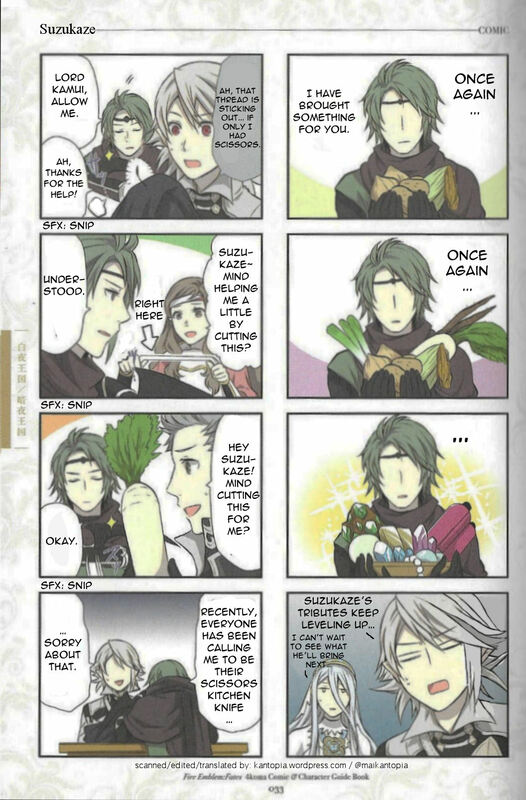 Silas decided to enlist in the Nohrian army, knowing that it was the best way to meet his friend again. Silas has a rough and boy-ish voice, with strong determination. Silas is very kind. Today's drills really got the blood pumping. Expect good things from me next battle! Good work today. But don't push yourself too hard, OK? I like to train and reminisce about the past. Not at the same time, of course. 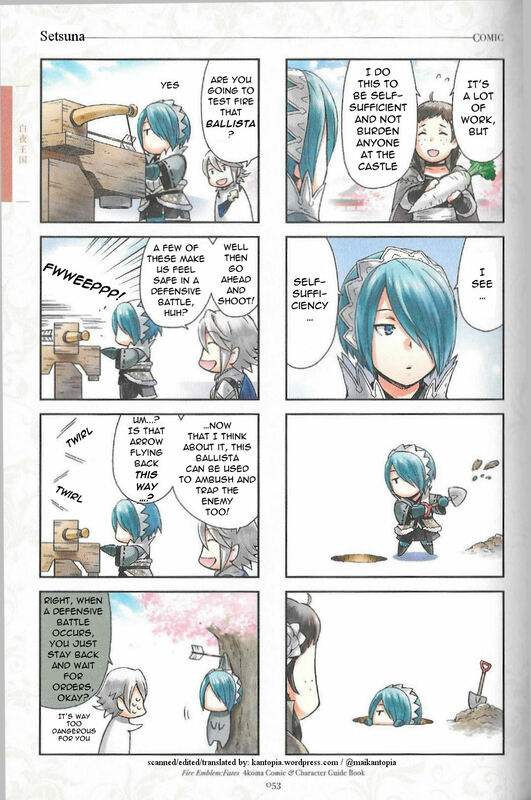 A member of a noble family in Hoshido, Setsuna was born with a silver spoon in her mouth, a fact that saw every one of her heart's desires fulfilled almost instantaneously. This fact alone has resulted in her feeling that her life lacks any sort of excitement. This feeling of Setsuna's was altered one day when she was accidentally caught in a hunting trap; despite the inconvenience, she derived much excitement in the event, and, according to her, it marked the first time in her life that she had ever felt alive. From this point onwards, Setsuna regularly gets herself caught in traps, although she often requires either Hinoka to free her from them. Setsuna has a soft and aloof/dorky voice. She mumbles a bit, but is very genuine. 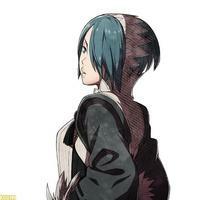 I'm Setsuna from the Kingdom of Hoshido. I'm good with bows. And, uh...falling into traps? On patrol, huh? Watch out for traps. Or you'll fall into one. Wait... Am I in a trap now? You'll help me if I fall into a trap, right?